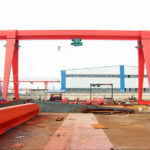 A frame gantry crane is found many uses in the heavy loads lifting applications, including construction site, manufacturing, shipyard, railway, warehouse, freight yard and port. 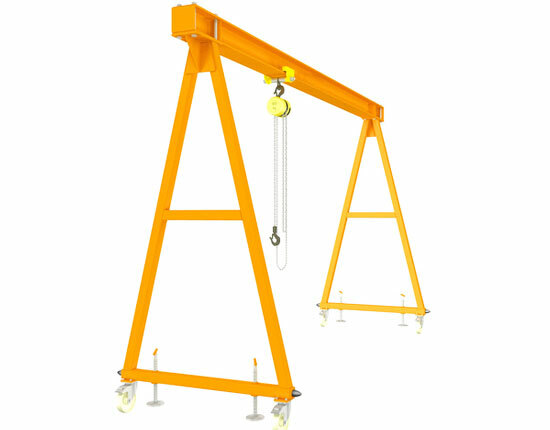 The A frame crane is typically outfitted with electric hoist and trolley, which are used to raise and lower heavy loads as well as move them horizontally. 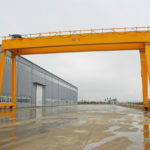 The gantry crane A frame is the most typical type used in varied fields and sections, and it is generally divided into single girder and double girder according to the number of girders. Ellsen machinery provides an array of gantry cranes to meet your specific lifting needs and help increase your production to the utmost. Incorporating several simple machines, the A frame lifting equipment has the ability to transfer heavy and bulky items with a great efficiency. 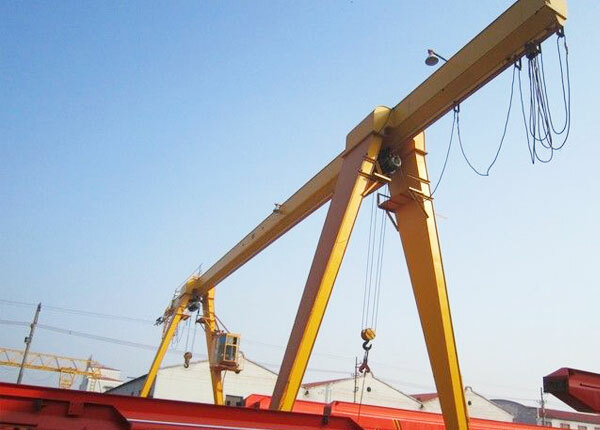 According to the load carrying capacity, working environment and ease of use, our A frame gantry cranes come in multiple types, such as single girder crane, double girder crane and mobile A frame gantry crane. Each type of gantry lifting equipment manufactured by our factory can be custom designed and built to suit your special needs. The single girder A frame gantry crane is an ideal solution for your lightweight lifting, commonly employed in manufacturing industry, construction, railway, shipbuilding industry and port. It is generally equipped with electric hoist. 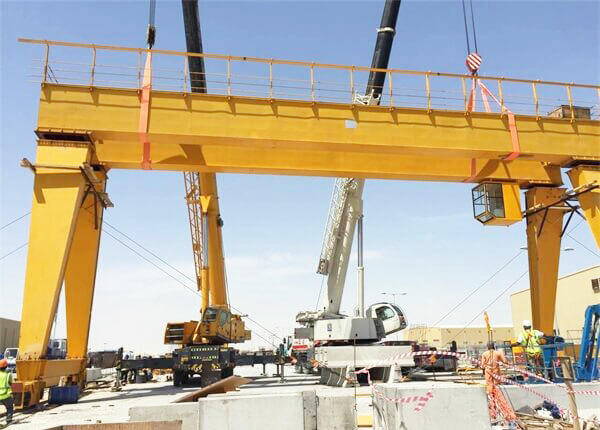 For your large capacity lifting needs, A frame double girder gantry crane can be a perfect option as it is capable of loading and unloading heavy goods 50 ton, 100 ton and even beyond. With respect to the way it moves, the A frame lifting device can be classified into rail mounted type and mobile unit. Portable A frame gantry cranes is a kind of wheel mounted crane that can move freely in your facility. It is ideal for your light duty lifting tasks not more than 10 ton. The mobile A frame lifting equipment is available in fixed type and adjustable type for you to choose from. The A frame gantry crane is usually constructed with box girder for the ease of construction and high strength. When used for special environments, such as strong winds and storms, the gantry lifting system can be built with truss structure which has strong wind resistance. 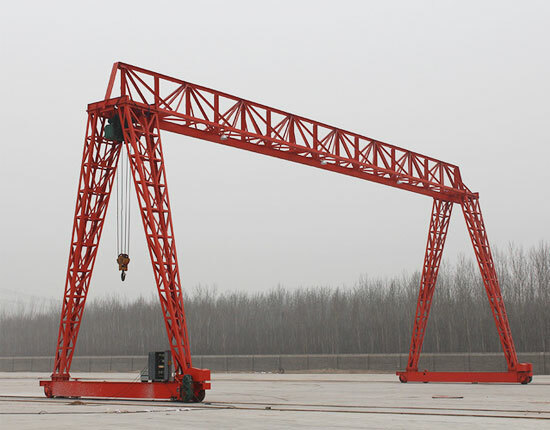 In addition, based on your specific uses, the A type gantry crane can be built with or without cantilever. When selecting a lifting system for their plants, most customers are not certain which type can best serve their needs or will create maximum value for them. 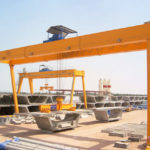 In such case, you should consider a few things such as gantry crane specifications, environmental conditions, frequency of use as well as safety considerations. Specifying your lifting requirements will be very helpful for you to make the best purchasing decision. If you have any doubt, welcome to Ellsen for advice. We will help you make a smart decision and offer an affordable gantry crane for your needs. 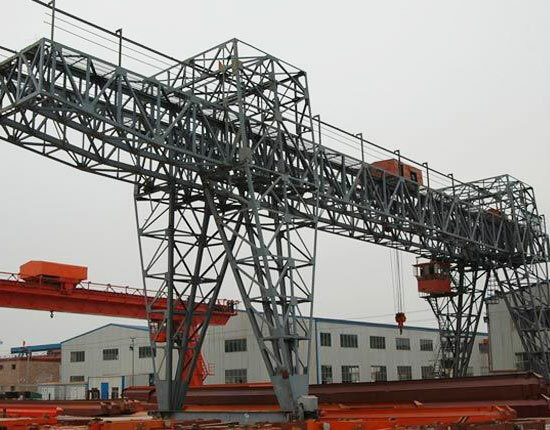 A frame gantry crane is mainly composed of gantry frame, hoist trolley, running mechanism and electric control system, of which the gantry frame consists of main beam, end beam, supporting legs, end carriages, trolley track and so on. Steel is the main substance used to fabricate gantry cranes, and carbon steel Q235 is commonly adopted to manufacturer the metal structure of the crane that does not require very high strength. For the high tensile strength and great yield limit requirements, low alloy high strength structural steel Q345 will be employed. 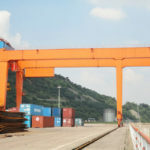 The gantry crane is usually equipped with electric hoist, such as wire rope hoist and chain hoist to help save manpower and improve the efficiency of lifting operations. 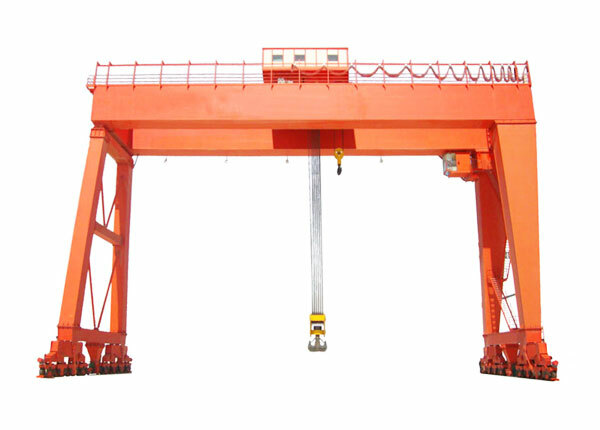 This electric gantry crane is generally operated by a driver sitting in the crane cabin or a worker from the ground. It can also adopt a combined operation method, such as cab control and wireless remote control, but these two methods cannot be used simultaneously. 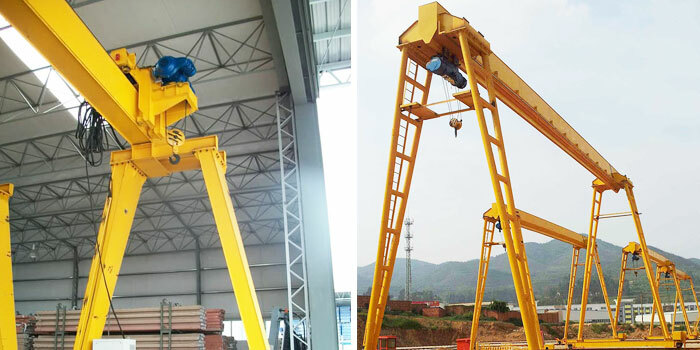 With regard to running mechanism, the gantry crane can be designed into rail mounted and mobile type. The rail mounted gantry crane has a fixed rail path, whereas mobile gantry crane can achieve a more flexible lifting movement. It can be either wheel mounted or rubber tyred type. 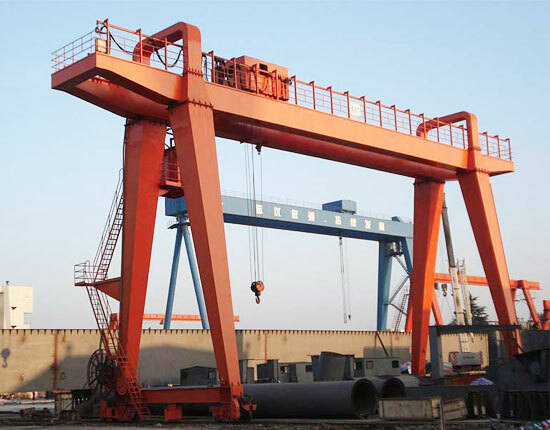 To realize an optimal performance, the A frame gantry crane supplied by our company is designed with anti-swaying device, anti-collision device, limit switch and so on. 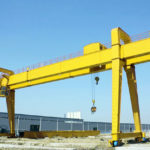 For open-air uses, the gantry cranes are suggested to be outfitted with rain cover, windproof and anti-slip device to prevent the damage of the equipment and components as well as fatal accidents. If you have any question about A frame crane design, contact us online. We are ready to solve any problem you have. 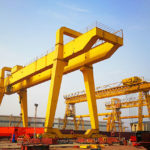 Why Should You Employ A Frame Gantry Crane? 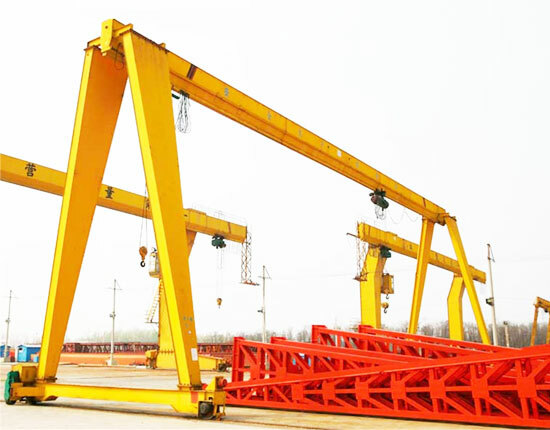 The name A frame gantry crane comes from A-shaped legs viewed from side profile. It can meet most lifting needs of customers and make the lifting jobs done fast and safe. By employing such equipment, they will get a lot of benefits. It is capable of handling heavy materials beyond the capability of humans. The gantry lifting equipment is an efficient and safe solution for material handling. It is also a cost-efficient substitute to other lifting systems, such as overhead crane for that it does not require any construction of overhead runway beam and engineering columns. The A frame gantry crane has easy installation. It can also be relocated in other workplaces easily. It provides stable and smooth lifting movements, and there is low noise during movement. The equipment has long working life and requires minimal maintenance. 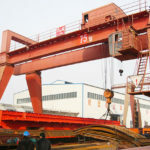 How to Take Care of Your A Frame Gantry Crane? Inspections and preventive maintenance enable you to keep a close eye on the equipment wear and tear so as to avoid crane breakdowns and property losses. Therefore, a periodic inspection such as once a month and once a year should be conducted. For some critical components that directly affect the performance of the crane, a frequent inspection and preventive maintenance should be done to make sure they are in good working conditions. However, many crane users are unsure as to which is the best frequency for inspection and maintenance. There are a few factors determining the frequency of inspecting and serving your crane, including A frame crane design, frequency of use and environmental conditions. To determine a proper frequency, the crane users should monitor the actual machine usage and watch for the signs of wear. In addition, gantry crane operator training is essential as most crane accidents result from human errors. Improper usage will not only lead to premature wear and breakdown, but cause serious and even fatal accidents. Therefore, crane operators should be deemed competent to operate the equipment and strictly follow operation manuals and rules. 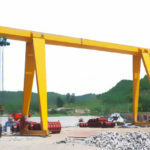 To know more about A frame gantry crane, contact us online or call us now.